NEW YORK (AP) Phillies prospect Enyel De Los Santos was slated to be the International League’s starting pitcher in the Triple-A All-Star Game on Wednesday. Instead, he joined the big club and made the most of an unexpected opportunity. Staked to an early lead and armed with an unorthodox and deceptive slingshot delivery that Philadelphia manager Gabe Kapler dubbed a ”crossfire,” De Los Santos (1-0) cruised for most of the night against a scuffling Mets lineup that’s managed only eight runs over the last five games. Acquired from San Diego in December for shortstop Freddy Galvis, De Los Santos was also chosen to play for the World Team in Sunday’s All-Star Futures Game. ”I’m seeing the ball better,” Franco said. Williams lined a two-run single in the third. 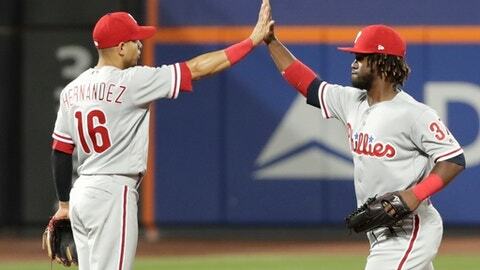 Herrera clubbed a solo shot into the Phillies’ bullpen in the fifth for his career-high 16th home run. At the plate, Gagnon drove in Rosario with a sacrifice fly – giving his family in attendance something to cheer about. Mets: 2B Asdrubal Cabrera exited in the seventh with a hyperextended left elbow but should be able to play Wednesday night, according to manager Mickey Callaway. … RHP Noah Syndergaard plans to throw a bullpen Wednesday. If all goes well, he will start Friday night against Washington. Syndergaard has been sidelined since late May with a strained ligament in his right index finger. … RF Jay Bruce felt discomfort in his hip when he began baseball activity. He has been shut down for a 10-day period that started Sunday, according to Callaway. After that, Bruce’s condition will be reassessed. Phillies: Recovering from a bruised forearm, RHP Vince Velasquez (5-8, 4.69 ERA) is expected to return from the 10-day disabled list to start Wednesday night’s series finale. Velasquez was hit just below the right elbow by a line drive on June 30. He retrieved the ball and threw it left-handed to first base to get the out, falling to the ground in pain immediately afterward.